(Nanowerk News) This potentially scalable graphene production method has just been published in Advanced Functional Materials by the ICN2 Nanobioelectronics and Biosensors Group, led by ICREA Prof Arben Merkoçi, in collaboration with the Department of Chemical Sciences from University of Naples “Federico II”, led by Prof. Paola Giardina. The method consists in the exfoliation of low cost graphite using ultrasonic waves in synergy with a surface active and self-assembling protein extracted from an edible fungus. The production of defect-free graphene and its biological interfacing are crucial requirements for the biomedical exploitation of graphene. Researchers from the ICN2 have designed a new method for the in situ production of biofunctionalised few-layer defect-free microsheets of this promising nanomaterial. The new method has been developed by the ICN2 Nanobioelectronics and Biosensors Group, led by ICREA Research Prof Arben Merkoçi, in collaboration with the Department of Chemical Sciences from University of Naples “Federico II”, led by Prof. Paola Giardina. The first authors of this research are Alfredo M. Gravagnuolo and Dr Eden Morales. The results have been published today in Advanced Functional Materials ("In Situ Production of Biofunctionalized Few-Layer Defect-Free Microsheets of Graphene"). In the study, Prof Merkoçi’s Group offers a promising approach that consists in the exfoliation of low cost graphite using ultrasonic waves in synergy with a peculiar surface active and self-assembling protein. Such protein, called Vmh2 hydrophobin, is extracted from the mycelium of the edible fungus Pleurotus ostreatus (commonly known as “oyster mushroom"). The described phenomenon occurs in the liquid phase and allows obtaining bio-hybrid micro-sheets of high quality graphene. As a potentially scalable approach, this method could enable massive production of biofunctionalised graphene, which could be a valuable material for the upcoming diffusion of new nano-biotechnologies in the global bio-medical market. 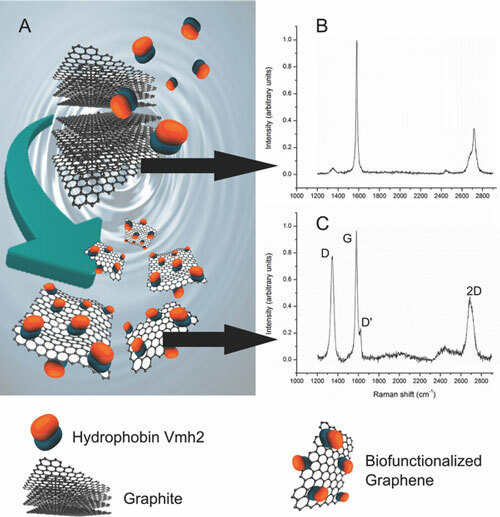 The obtained product is likely to prove valuable for the emerging applications of graphene in the biotechnological field including nanomedicine, sensing and bioelectronics technologies besides others.